Paris: Librairie Renouard -- Henri Laurens, Editeur, 1911. 1/2 Vellum. Near Fine. 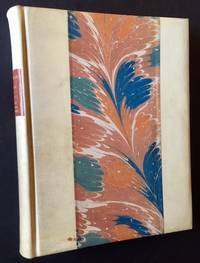 A lovely copy of the 1911 1st edition, bound in a sumptuous 1/2 vellum over marbled boards. Crisp, clean and Near Fine, with just a touch of very light spotting toward the front panel's bottom-edge and along the spine. (The original wrappers, crisp and well-preserved with very minor soiling, have been bound-in). Quarto, fascinating study of animal representation in Classical Greek vase paintings. THIS COPY BELONGED TO A CHILDREN'S ILLUSTRATOR OF THE FIRST-RANK, FEODOR ROJANKOVSKY, whose wonderful bookplate adorns the front pastedown. Athens: Pyli Editions, 1977. Cloth. Near Fine. INSCRIBED BY THE AUTHOR ELPIS MITROPOULOU on the front pastedown. A solid, very clean copy to boot of the 1977 stated 2nd edition (stamped as such on the title page). Tight and Near Fine in its deep-red cloth, with crisp titling along the front panel and spine. Octavo, chapters include "The snake as a fertility god or hero", "The snake as healing medium", "The snake as symbol of oracular power", etc. Privately Printed, 1960. Cloth. Very Good +. INSCRIBED BY THE AUTHOR JOHN REINHARD on the front free endpaper. A solid copy to boot of this uncommon 1960 examination of Helen of Troy, limited to only 100 copies. Solid and VG in its light-blue cloth, with crisp gilt-titling to the front panel. Light offsetting at the endpapers and pastedowns, foxing along the fore and bottome edges, otherwise very clean. Octavo, also includes the publisher's laid-in errata slip. Cambridge University Press, 1929. The 1929 1st edition. Solid and VG+ in its navy-blue cloth, with bright gilt-titling along the spine. Very light, minor spotting to the panels, otherwise clean as could be, with no writing or markings of any kind internally. Octavo, 175 pgs. of text plus Index. 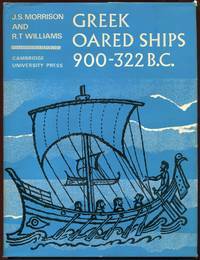 Cambridge, MA: Harvard University Press, 1955. Cloth. Very Good +. 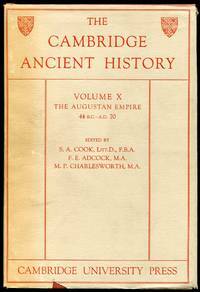 The 1955 1st thus, edited by Arthur Stanley Pease. Cicero's text in Latin, the extensive notes (which make up 95% or more of the book) are in English. Solid and VG in its crimson cloth, with light rubbing along the spine and light offsetting to the rear panel's lower-edge. Thick octavo, 537 pgs. By Edited by S.A. Cook et al. 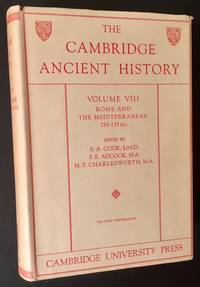 Cambridge University Press, 1939. Cloth. Near Fine/Near Fine. 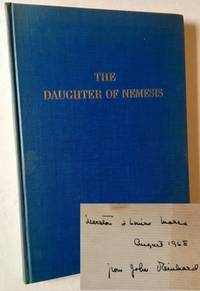 A solid, very impressive copy of the 1939 1st edition. Tight and Near Fine (a touch of offsetting at the front and rear endpapers) in a crisp, price-clipped, Near Fine dustjacket, with just a bit of creasing along the spine crown. Thick octavo, 849 pgs. plus fold-out maps thruout. By Edited by I.E.S. Edwards et al. Cambridge University Press, 1970. Cloth. Near Fine/Near Fine. A crisp, very sharp copy of the 1970 3rd edition. Tight and Near Fine in a bright, price-intact, Near Fine dustjacket, with just a touch of creasing along the front panel's bottom-edge. Thick octavo, 758 pgs. plus fold-out maps thruout. By Edited by I.E.S. Edwars et al. Cambridge University Press, 1971. Cloth. Near Fine/Near Fine. A clean, crisp copy of the 1971 3rd edition. Tight and Near Fine (just a touch of light scuffing at the edges) in a crisp, price-clipped, Near Fine dustjacket. Thick octavo, 1,058 pgs., top-edge gilt, fold-out maps complementing the text. Cambridge University Press, 1973. Cloth. Near Fine/Fine. 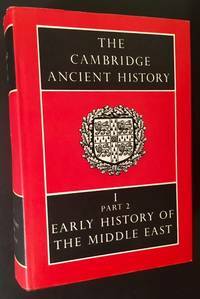 A very impressive copy of the 1973 3rd edition. Solid and Near Fine (just a touch of streaking at the rear panel) in a crisp, price-intact, Near Fine to Fine dustjacket. Thick octavo, 868 pgs., top-edge gilt, fold-out maps complementing the text. By Edited by J.B. Bury et al. Cambridge University Press, 1953. Cloth. Near Fine/Near Fine. A very solid copy of the 1953 "reprint, with corrections". Clean and Near Fine in a crisp, Near Fine example of the older, cream-colored dustjacket, with light creasing along the spine crown. Octavo, 554 pgs. Cambridge University Press, 1954. Cloth. Fine/Very Good +. A tight, very well-preserved copy of the 1954 2nd impression. Clean and Fine in a crisp, VG+ example of the older, light-colored dustjacket, with one tiny closed tear along the spine crown. Thick octavo, 840 pgs. plus glassine fold-out maps at the rear. 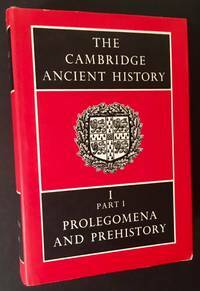 London and Cambridge, MA: William Heinemann Ltd. and Harvard University Press, 1959. Cloth. Near Fine/Very Good +. 1959 early reprints, in the first 2 volumes (of 5 total). Both volumes tight and Near Fine. And, in crisp, VG+ examples of the much less common pale dustjackets, with light chipping along the spine crowns. Translated into English by W.H.S. Jones. 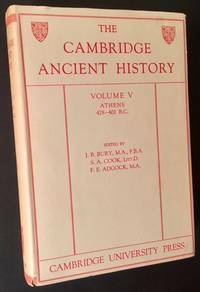 Part of the wonderful Loeb Classical Library series. 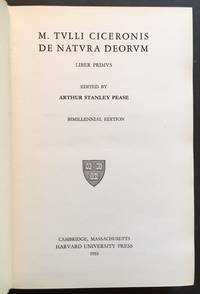 Harvard University Press (Loeb Classical Library), 1947. Cloth. Near Fine/Very Good +. 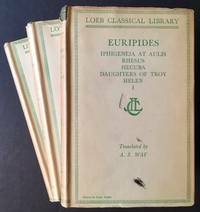 The first 3 volumes of Loeb Classical Library's Euripides, all in their vintage, light-colored dustjackets. All 3 volumes are clean and Near Fine in bright, VG+ dustjackets, with light chipping to Vol. I's spine crown and very light scuffing at its front panel. Vol. 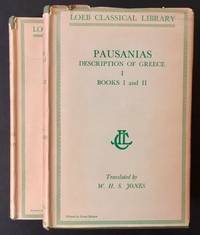 I: Iphigeneia at Aulis/ Rhesus/ Hecuba/ Daughters of Troy/ Helen; Vol. II: Electra /Orestes/ Iphigeneia in Taurica/ Andromache/ Cyclops; and Vol. III: Bacchanals/ Madness of Hercules/ Children of Hercules/ Phoenician Maidens/ Suppliants. These vintage reprints were published between 1947-1953. 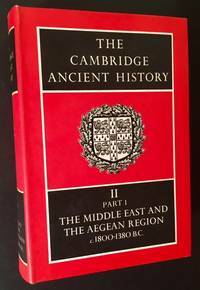 Cambridge University Press, 1968. Cloth. Near Fine/Near Fine. A very solid copy of the 1968 1st edition. Clean and Near Fine in a bright, price-intact, Near Fine dustjacket, with just a touch of soiling at the rear panel. Quarto, 356 pgs. Cambridge University Press, 1957. Cloth. Near Fine/Very Good +. A sharp copy of Vol. 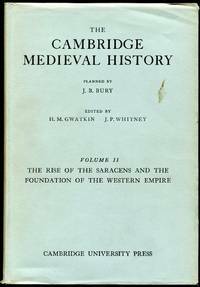 III of The Cambridge Medieval History. Tight and Near Fine in a bright, price-clipped, VG dustjacket, with very light creasing at the spine ends. Thick octavo, 700 pgs., top-edge gilt. Cambridge University Press, 1957. Cloth. Near Fine/Very Good. The 1957 re-issue of Vol. 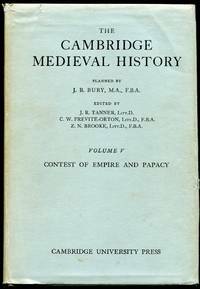 II of The Cambridge Medieval History. Clean and Near Fine in a bright, price-clipped, VG dustjacket, with light soiling at the front panel and light chipping to the spine base. Thick octavo, 889 pgs., top-edge gilt. 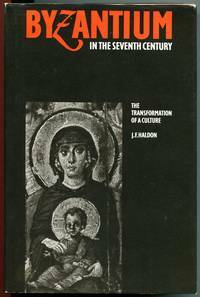 Cambridge University Press, 1990. Cloth. Near Fine/Near Fine. A bright, very sharp copy of the 1990 1st edition. Tight and Near Fine in a crisp, Near Fine dustjacket. Octavo, 486 pgs. Cambridge University Press, 1958. Cloth. Near Fine/Near Fine. The 1958 re-issue of Vol. 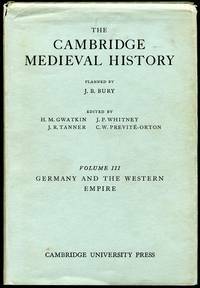 VII of The Cambridge Medieval History. Clean and Near Fine in a bright, price-clipped, Near Fine dustjacket, with just a touch of wear along the spine crown. Thick octavo, 1,073 pgs. Cambridge University Press, 1957. Cloth. Near Fine/Very Good. 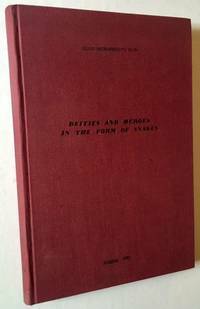 A solid, well-preserved copy of the 1957 re-issue of Vol. 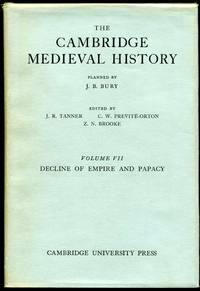 V of The Cambridge Medieval History. Clean and Near Fine in a bright, price-clipped, VG dustjacket, with mild darkening along the spine and very light creasing to the panels. Thick octavo, 1,005 pgs., top-edge gilt. Cambridge University Press, 1952. Cloth. Near Fine/Very Good +. A handsome copy of the 1952 "reprint with corrections", following the 1934 1st edition. Clean and Near Fine in a bright, price-clipped, VG+ dustjacket, with several very small closed tears at the spine ends and one tiny chip at the front panel's lower-edge. Thick octavo, 1,058 pgs., fold-out maps at rear.